Our base is in Akureyri in the north of Iceland. Our Truck is modern Benz truck with room for 16 pers + guide. We also have 3 different trailers for baggage or other items. UNIMOG is a name that stands alone for one of the best light truck families ever made. UNIMOGs are in military and civilian service all over the world; over 298,779 were produced from 1948 through 1993. Our main trip this summer is 5 days trip in july and agust. In September we also organize photo tours with photo expert as a guide, a 10-12 hours trip to the highlands. Come with us and experience the tranquility in the valleys in the north. 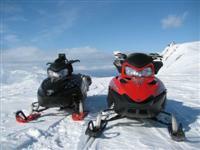 Come join us for a snowmobile tour. Within few minutes drive from downtown Akureyri. Our truck is a Benz Unimog that seats 16 persons. The tires are 52" and there are a few conditions that stop it.